There are still large deficiencies in small arms and light weapons (SALW) and conventional ammunition (CA) storage and management in the Great Lakes Region, the Horn of Africa and bordering states. Particularly state capacities to plan and implement physical security and stockpile management (PSSM) interventions remain limited. 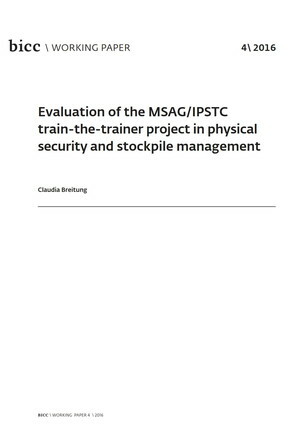 Addressing these capacity shortfalls, the Multinational Small Arms and Ammunition Group (MSAG, with Germany as the lead nation), in collaboration with the International Peace Support Training Centre (IPSTC) in Nairobi, has implemented a PSSM train-the-trainer project since 2014. This report provides an overview of the project’s achievements and challenges, and gives recommendations on the way forward to enhance PSSM capacity in the region. The information provided is mostly drawn from interviews with training participants.